Tooth loss can have a far-reaching effect on your dental health and personal appearance. When you lose one or more teeth, your remaining teeth can drift out of position. This can lead to a change in the bite, the loss of additional teeth, decay and gum disease. Dental implants can be an effective method to replace one tooth or several teeth. Each implant consists of a metal anchor that is inserted into the jawbone (the implant), and a protruding post (abutment), which is outfitted with an artificial tooth (crown). 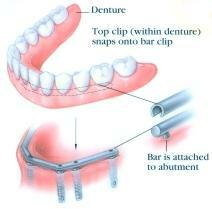 Implants can also support a bridge, replace a partial denture or secure a denture. The process requires surgery and may take up to a year to complete. Note: I restore the implant with the crown or bridge, the actual implant is placed by the oral surgeon or periodontist. In the first procedure under anesthesia, a metal anchor (implant), or artificial root, is placed into the jawbone. Bone grows around the anchor. This takes about three to six months. Next, a “healing” cap is placed when the implant is uncovered. Then, the healing cap is removed and a metal post (abutment), may be attached to the anchor. An impression or mold is made of the abutment, and the surrounding teeth. When your gums and jawbone have healed, an artificial tooth (crown) is constructed, then screwed or cemented to the post. Fitting your new tooth properly may take several appointments. This type of prosthesis can replace two or more teeth. It is the most commonly performed implant procedure, and may require only two or three implants.